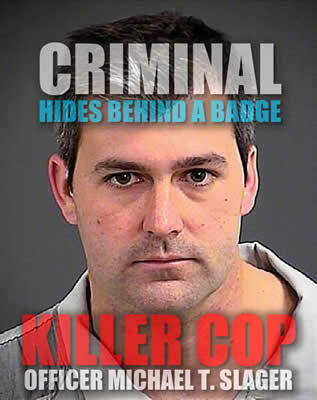 A white South Carolina police officer Michael T. Slager was arrested and charged with murder Tuesday after video showed him fatally shooting a fleeing, unarmed black man in the back. Does anyone notice today’s officers shoot far too many rounds at people. A decade ago when revolvers were used far less shots were fired and less people were killed. Perhaps we need to look at limiting the number of rounds police weapons can fire as over kill is becoming common. This is why we don’t need military weapons used on public streets by police. North Charleston Police Officer Michael T. Slager, 33, can be seen shooting 50-year-old Walter Scott after a confrontation on Saturday, according to The Post and Courier. Slager chases Scott and shoots him eight times in the back the video recorded by a passerby and obtained by The New York Times. Scott died there, though it wasn’t clear if he died immediately. Officer, Michael T. Slager, 33, said he feared for his life because the man took his stun gun in a scuffle after a traffic stop on Saturday. A video, however, shows the officer firing eight times as the unarmed manWalter L. Scott, 50 — fled. A magistrate denied bond for Charleston, SC, police officer Michael Slager, for shooting an unarmed black man, Walter Scott 50 yrs old, following a traffic stop. Officer Michael Slager can attempt to have bail reduced through a circuit judge. Lets see if the Police union and their millions come to the rescue of a killer? The FBI and the Justice Department’s Civil Rights Division launched investigations into the execution of Walter Scott.